Auditing of Existing Flat & Pitched Roofs. Asbestos & Metal Refurbishment Over-Roofing Systems. Built up roofing & cladding systems for thermal and acoustic performance. 4 Hr Fire Resistant Cold Store Panels. Market Leading High security wall, roof & floor panels. Steel walkable liner installed on top of the purlins. Innovative bar & bracket support system. Class A non-combustible mineral wool insulation. Choice of Roof sheet profiles, materials and finishes. No stripping and costly disposing of asbestos materials. Existing roof provides the platform to work from, when installing the new roof system. Minimum disturbance to the use within the building. Low cost to upgrade the roof to a energy efficient roof system. Upgrade flat roofs to energy efficient roofs. Existing flat roof remains in-situ. Range of different roof finishes. Reduce operational costs of the building. Lengths of up to 12 m.
Non-combustible stone wool cores are rated as A1 Non-Combustible. LPCB & FM approved, with fire ratings of up to 4 hours. Temperatures down to -28 degrees C.
High security core encased with anti-cutting material to SR3 & SR4 level. Full understanding of performance specification & contract programme. Full reporting system at the key stages of construction. Full set of construction issue drawings. Installing high quality systems, on time and to specification. Design review of roofing contractors drawings. Site inspections to audit workmanship at key stages. Airtightness & perimeter detailing audit. Lightweight steel flat to pitch over-roofing refurbishment system. A tailored ‘Flat to Pitch’ or ‘Flat to Curved’ Over-Roofing conversion system provides the perfect cost effective solution in permanently removing water ponding on failed flat roofs whilst if required, totally transforming the appearance of the roof and the perimeter details. The lightweight system is designed to accommodate the tolerances in most existing structures whether the new roof system is a lightweight metal roofing system i.e aluminium standing seam or steel roof sheets, or the heavier roof tiles or slates. Existing structures will need to be checked before work commences. 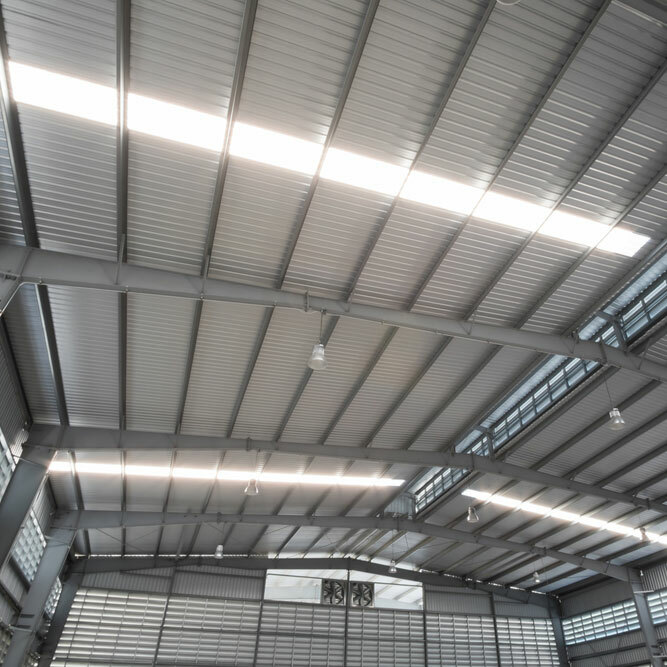 The system is designed and supplied in a kit form system which is assembled and installed on site, or delivered to site in a free spanning truss. Roofing systems can be installed while building remains in use. Increase the thermal performance and aesthetic of the building. Significantly reduces the long term maintenance cost of the existing flat roof. Reduces the carbon emissions of the building. Existing roof system remains in-situ throughout installation. Opportunity to increase the security and reduce the solar gain. Eaves overhangs with smooth bullnose details can stop unwanted access to the roof. What roof systems can be used with this system? All types of standing seam & concealed fix systems. Pierce fixed metal roof systems.